Police Community Support Officers (PCSO) undertake a vital function in support of their local communities and those North Wales have recently been equipped with mountain bikes to help them get around their local areas. However, recognising that cycle crime is an issue which affects everybody, they have ensured that their bikes come with the added benefit of a Datatag Cycle security system. Designed not only to be an active deterrent to theft the systems use an almost invisible UV etch to mark the frames and various components making identification easy should they get stolen. 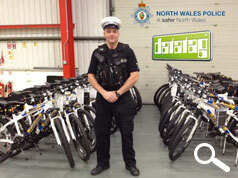 All in all North Wales police have marked 30 police mountain bikes for PCSO use and Huw Jones, Commissioning Manager said, "we are delighted to work with Datatag to help ensure the security of our fleet and also enable us to manage the allocation of our fleets as the technology is the perfect asset management tool." 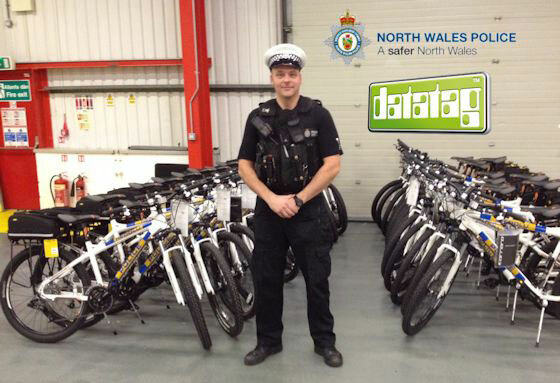 Datatags Dave Luscombe said, "We are very pleased that North Wales Police have chosen to protect their new Mountain Bikes with the new Datatag UV cycle security system. Datatag is a proven theft deterrent and is also proving its value as an asset management tool to help fleet managers keep track of where their bikes have been allocated." PCSOs are uniformed police staff who work to complement and support regular police officers. By using bicycles they are able to provide a visible and accessible uniformed presence, aimed at improving the quality of life in the community and offer greater public assurance.